These are the core operators and symbols. This is plenty to masterfully search and source on Google; the rest is practice, art, and experimentation, I think 🙂 (Please let me know if you feel you’d like to add another operator or a symbol to this). 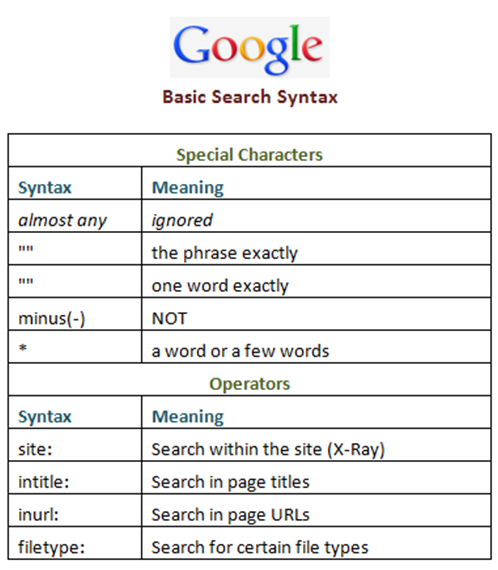 The list reflects the most recent changes in Google’s Boolean syntax. Do not use AND in your searches. AND is implied, has long been gone from Google’s help pages, and using it may result is odd results shown.